There was a brief deleveraging period in the United States following the 2008 financial crisis where Americans felt they should cut back on additional borrowing and even pay down some of their debts. This period did not last long as Americans almost immediately returned to the debt markets to borrow money on mortgages, auto loans and student loans. Loans for those three categories have been sponsored by the U.S. Federal Government (tax payers) through Fannie & Freddie (mortgages), Ally Bank (auto loans) and Sallie Mae (student loans). Hold on, Ally bank is a private company, right? That is true. It is the recreation of GMAC, which provided auto loans up until 2008 when it went bankrupt and was bailed out by the government. Ally is the worst kind of government monster where the share holders keep the profits during cyclical growth periods and tax payers pay for the losses during cyclical declines. This is how the U.S. banking system works today with Bank of America, Citigroup, etc., leveraging up and collecting profits and massive bonuses on the way up and tax payers standing ready to bail them out following the next collapse. The total U.S. debt mountain, after taking a moment to catch its breath in 2008, has now surged to $60 trillion in size. Any remembrance of what got the world into trouble leading into the last financial crisis has been completely swept from the collective conscious. The leveraged mania goes beyond the mountain in the chart above, even returning to the stock market. You can see in the chart below that we have now experienced the third "mountain of margin" (stock purchased with borrowed money) during the last 20 years. The third peak of the mountain came this past February with the climax of the biotech stock mania. One area within the credit markets where many thought Americans had finally learned their lesson following the 2008 crisis was credit cards. While mortgages, auto loans and student loans have surged higher during the last five years, Americans have continually paid down their credit cards and refused to open/use new accounts. This changed in early 2014. Americans stopped paying down their credit card debt and have opened their wallet to go out and spend future earnings/savings. After all, they are now certain their 401k balances and home prices will only move higher next month and the month after. These higher levels of appreciation will take care of any money needed down the road to pay off additional debts taken on today. But what if 401k balances and home prices began to move sideways or even decline? All that would be left under the surface to pay down these debts would be real wages. Beneath the $60 trillion mountain of debt, it is real wages of the American people that must ultimately grow in order to pay off these existing and future liabilities. Ultimately, Americans are responsible for paying off the debts borrowed by federal, state and local governments through taxes. They are responsible for paying off their mortgages, student loans, auto and credit cards. They are even responsible indirectly for paying off commercial and business loans because they must purchase the products these businesses create with the money left over every month after taxes and loan obligations have been paid. 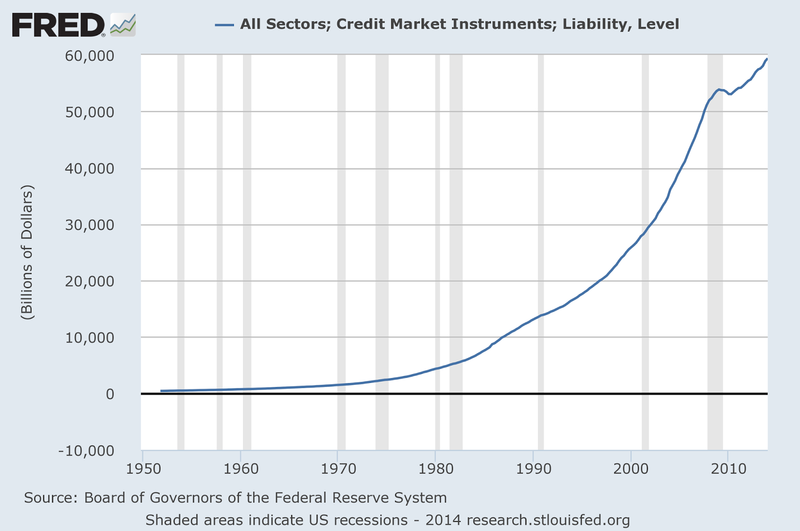 Here, unfortunately, is where we see the magical economic circle of printed money and credit growth does not complete. 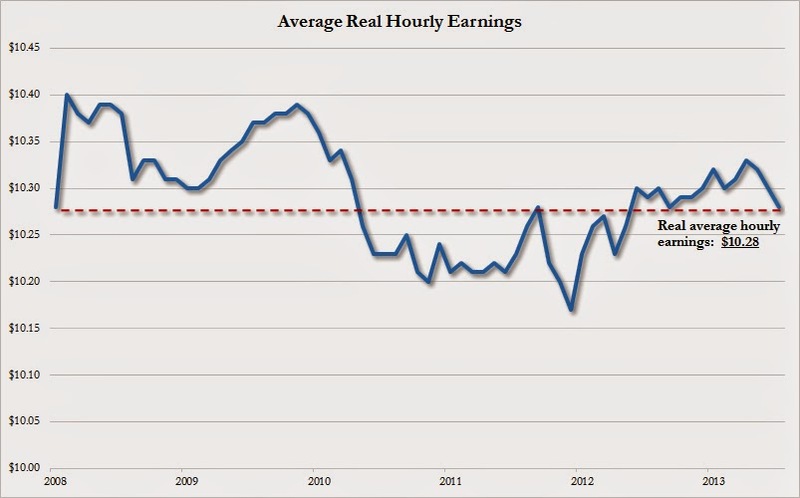 Data released this past week shows that real average hourly earnings are now at the same level they were the month after Lehman failed back in 2008, almost six years. While the illusion created through massive borrowing and printed money has been truly epic, the resolution will be equally legendary. As asset prices begin to decline and the debt mountain begins to implode, the world will find out the god-like powers central bankers are believed to possess are nothing more than a parlor trick. Then you will see fear spread across the collective conscious in unprecedented fashion. As the world rushes toward the precious liquidity available, there will be a once in a generation fire sale buying opportunity for the once beloved paper asset prices around the world. Stay patient.